The trans-o-flex Logistics Group has finalised the change in its Board of Directors initiated in the previous year. At the beginning of February, Frank Iden (49) assumed the position of Chief Executive Officer. Max Moser (59), the former CEO, will put into practice what he has been planning for a long time and retire. 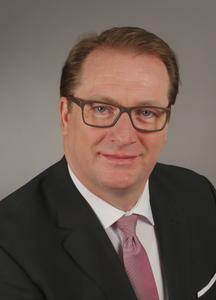 In April 2014, after holding the position of Head of Paketlogistik Österreich of Österreichische Post AG for eight years, Max Moser had assumed the management of the trans-o-flex Logistics Group. Already from October 2015, Frank Iden could prepare himself for his tasks as successor of Moser and his new area of responsibilities. In his capacity as Managing Director of trans-o-flex Netzwerk Group GmbH, he was already responsible for the co-operation with the trans-o-flex system partners, which operate a total of 28 locations of trans-o-flex Schnell-Lieferdienst, and, as Head of Strategy and Corporate Development, was also in charge of strategic projects of the trans-o-flex Logistics Group. “I am happy to continue what Max Moser has begun “, says Frank Iden. “The focus of my work will be on continuously improving the structures and processes in the extremely flexible trans-o-flex system in the operational business, on increasing the profitability in the financial area as well as, with respect to our strategy, on concentrating on logistic solutions for specific industries, above all for the pharmaceutical as well as the home entertainment / consumer goods industries as our core sectors. For his new tasks, Frank Iden, who has a degree as forwarding merchant, can look back on more than 30 years of experience in the logistics business, holding management positions at Hermes, primeMail, Deutsche Post, TNT and Interfracht. Frank Iden’s colleagues in the Board of Directors of the trans-o-flex Logistics Group will be Christian Knoblich (Sales & Marketing) and Michael Stadlmann (Finance & Controlling). The success of the Europe-wide operating trans-o-flex Logistic Group is based on three pillars, the services of which can be perfectly combined with each other: 1. trans-o-flex Schnell-Lieferdienst offers a full-coverage network for the efficient and safe transportation of parcels and pallets (combi-freight) all over Germany. This also includes numerous additional services, such as the transportation of hazardous goods without being limited to small quantities. 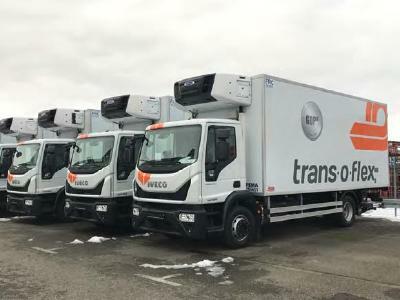 At the same time trans-o-flex, in its capacity as shareholder and partner of the Eurodis network, provides full-coverage combi-freight services in 34 European countries. The company has developed a large number of tailor-made solutions for specific sectors, e.g. for the pharmaceutical and home entertainment / consumer goods industries. 2. With a special network for active temperature control in the temperature ranges of between 2 and 8 °C as well as 15 and 25 °C, trans-o-flex ThermoMed takes over the transportation of temperature-sensitive goods for the pharmaceutical industry. In addition to this, ThermoMed, with its EUROTEMP network, also provides actively temperature-controlled transportation services in 15 countries in Europe. 3. Comprehensive logistic services from storage and picking/packing to value-added services, such as the set-up service for sales displays or electrical appliances, up to customer-specific transport networks are developed and implemented under the umbrella of trans-o-flex Logistik Service. In 2014, annual sales of the Group, which has a workforce of approximately 1,900 employees, amounted to ca. € 500 million. 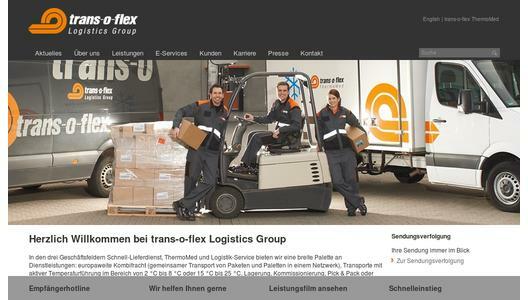 Since June 2008, trans-o-flex has been a 100-% subsidiary of Österreichische Post. For more information, go to www.trans-o-flex.com.